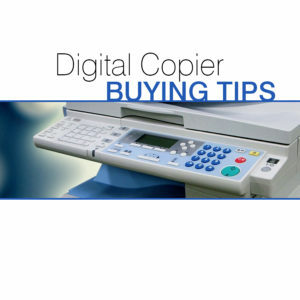 Without a doubt – there are do’s and don’ts to think about when you’re going to buy a copier. The range in price is enormous, with lower end models costing as little as $150 with the higher end models coming in as expensive as $50k. In most cases, a propertly remanufactured copier should cost you $2,500-$7,000 depending on your office’s needs. While the lower end all in one that costs $300 might seem like a good deal at the time, it can quickly backfire. Their cost per page is actually five to ten times that of a larger office copier and the ink alone in one year can add up to more than a thousand dollars if you use it frequently. They’re a great deal if you have a home office, but if it’s an actual high-use situation – you’re just going to end up spending the money anyway. By buying a digital copier slightly used, you can save up to 80% of the original cost and also protect yourself AGAINST the depreciation of buying a brand-new copy machine. Even better yet – so long as you have a solid servicing agreement – you’re not going to give up an iota of performance or reliability. Color copiers are attractive for a lot of surface reasons, but they also cost eight times more than the traditional black and white models. It also comes with a bit of a hassle. You need to make sure your staff stays disciplined enough to use black and white settings 90% of the time, convince them to only use color on outgoing correspondence when the reality is the overwhelming majority of correspondence is internal and then convince them to keep the number of color copies THEY DO make to a minimum. Easy right!? Wrong! Sadly, the industry is pushing color copiers because they know they’re cash cows. From our standpoint – if your business NEEDS one, then they are a great tool to have. Seriously, they are. But if you don’t need it – pass. They can cost a lot and can become a headache to manage.